Known as the ‘Great Black One’ in Sanskrit or Chaturmukha, Four Faced Mahakala is an emanation of the Buddha of Wisdom, Manjushri. He is popularly known to be able to quash our obstacles arising from ignorance and anger. Being an enlightened Dharma Protector, he has been propitiated by many great masters including Lama Tsongkhapa, Nagarjuna and Tulku Drakpa Gyeltsen. 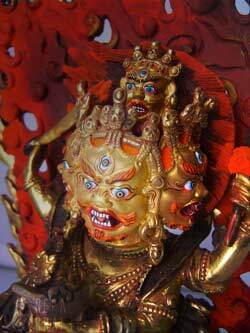 Four Faced Mahakala is also very well known to be one of the principle protectors of the Sakya tradition. He is also the main protector of Drepung Loseling Monastery and various Khangtsens in Ganden. 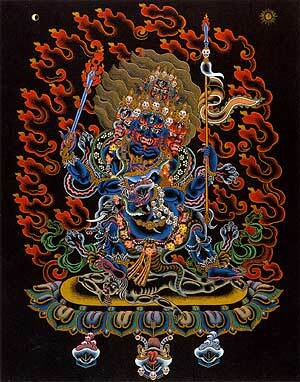 Four Faced Mahakala is the Protector of the Guhyasamaja and Chakrasamavara Tantras. There was once a great Tibetan translator by the name of Nyen Lotsawa. When he received the tantric practice of Guhyasamaja of the Jnanapada Lineage from Risula (a dakini), she also bestowed on him the initiation of Four Faced Mahakala. At this time, she gave him as a servant a dark skinned Brahman. When Nyen Lotsawa and the Brahman reached Nepal, the servant changed appearance and took on the form of a monk, an appearance more conducive for travelling in Tibet. After the passing of Nyen Lotsawa, the monk remained with Lama Nam Ka’upa and then later with Sachen Kunga Nyingpo. This dark skinned monk is considered by many to be the emanation of Mahakala himself. In later times, the Gelug School of Lama Tsongkapa adopted the Guhyasamaja practices and Four Faced Mahakala. Many more paintings and depictions of the four faced deity were made and he became a popular Protector. The vast majority of Tibetan and Mongolian paintings of Four Faced Mahakala are of the Gelug lineage. How is Four Faced Mahakala connected to Dorje Shugden? Both Four Faced Mahakala and Dorje Shugden are emanations of the Buddha of Wisdom, Manjushri hence they share similar natures. Besides that, they are both connected through Dorje Shugden’s previous life, Tulku Drakpa Gyeltsen. Four Faced Mahakala was one of the heart practices of Tulku Drakpa Gyeltsen for all his life. It is because of this reason that Dorje Shugden has a very intimate relationship with Four Faced Mahakala. This form of Mahakala has four faces and four arms indicating that he has realized the four noble truths. His central face and body is dark blue in color, while his right face is white, his left face is red and his top face is black. The main hands of Four Faced Mahakala holds a curved knife and a skull cup. The curved knife and the skull cup are iconic implements of Mahakala that symbolizes his enlightened nature in Tantric imagery. The second pair of hands holds a raised sword in the right and a spear in the left. The right leg is bent and the left straight standing atop a prone corpse-like figure. His three eyes stare at our negative karma and obstacles wrathfully with a vision of past, present and future simultaneously. This entry was posted on Saturday, November 26th, 2011 at 12:53 pm	and is filed under Articles. You can follow any responses to this entry through the RSS 2.0 feed. You can leave a response, or trackback from your own site. This is a short but detailed short write up about Mahakala. It allowed many of the readers to know better how Mahakala loomks like and the brief history of which high lamas prayed to this deity. Since both Dorje Shugden and Mahakala are emanations of Manjushri, would it mean that both are very similar and they are of similar purposes? Just that Dorje Shugden has been manifested to protect the Gelugpa lineage, and he is the protector of the uncommon times (now). Android, and make the knowledge of reading, comment, and vote more comfortable and pleasurable thing.